E is for Explore! 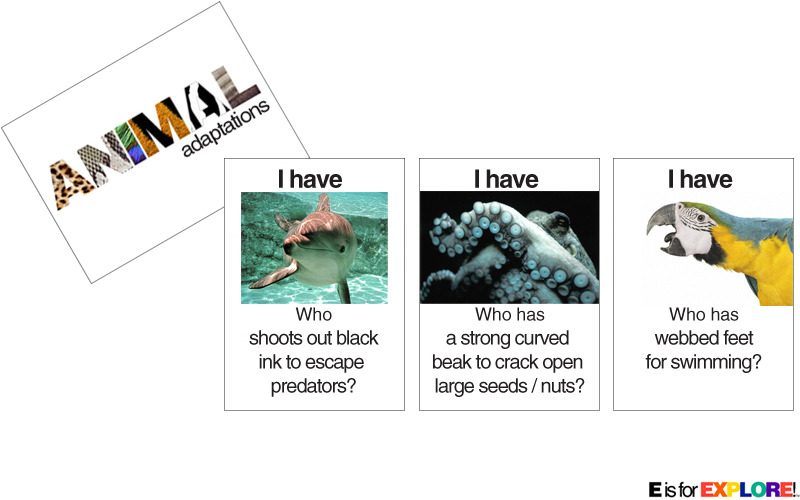 : Animal Adaptations - I Have, Who Has? Animal Adaptations - I Have, Who Has? we were just going over this whoa! Awesome of you. These cards look simply intriguing. Thanks!!! nicki562003@ gmail.com THe kids will love this! I'm teaching a 3 week unit on Plant and Animal Adaptations. I just began. I would absolutely love a copy. I would love a copy of these for my third graders. These are really neat! Would love a copy for my sons, as we homeschool. We could use them for our co-op for our game themed enrichment day that we have coming up soon. Thanks and hope that you are having a happy weekend! what a great way to review at our centers. Rebreb49@me.com. Wow! Thank you for your offer. I would love to have these for my daughter. I would love a copy! Thanks so much! I would love a copy. Thank you! This looks amazing. I would love a copy. Yes, please!!! And thank you!! I would love a copy! Thank you...so glad I found your blog. I would really love this! My kids have been working with animal adaptations for a couple of weeks and this would be such a great activity to make them think! Thank you! Wow! Great idea! Love the realistic pics! I'd appreciate a copy. Thanks so much! I love it!!! What a great idea!!! I would love a copy please thanks. Would love a copy of these! Thank you! Neat! May I have a copy please? I would love a copy, please! Vivid illustrations and thoughtful questions. Thanks so much! Send me a copy please!!! I would love a copy! Thanks...I love your blog. I would love a copy. Thank you so much! If you still have these, I would LOVE a copy!!! I am the school librarian and would love to share it with my science department. This is awesome! I would LOVE a copy! Thanks. I hope I'm not too late to get these! I would love a copy too! Thanks for the great idea. Hi! I would love a copy - great idea! I would love a copy for my 4th grade students. Nevermind.... I was able to get it on Google docs. Thanks! I would love a copy, thanks! May I please get a copy? May I please have a copy? This is really amazing.